4. 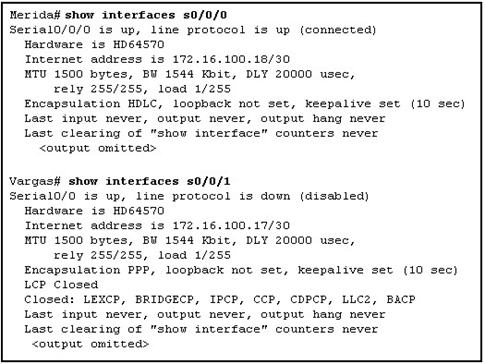 Which statement is true about the Cisco implementation of the HDLC protocol? • It has a universally compatible frame format. 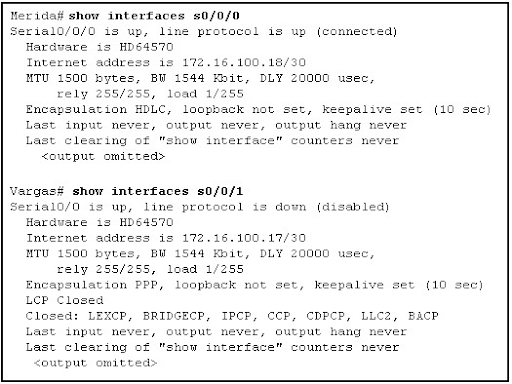 • It is the default encapsulation for serial interfaces on Cisco routers. • It does not support multiple protocols across a single link. Refer to the exhibit. A network administrator has a connectivity problem between the serial interfaces of Merida and Vargas. What is the cause of the problem? • Authentication is required on the serial link. • The encapsulation is misconfigured. • The IP addresses are on different subnets. • The serial interface on Vargas is shutdown. • The loopback interfaces on both routers are not configured. Refer to the exhibit. What statement is true about the exhibited output? • LCP is in the process of negotiating a link. • LCP and NCP are waiting for CHAP authentication to complete. • LCP negotiation has completed successfully, but NCP negotiation is in progress. • LCP and NCP negotiation is complete, and the data link service is available to carry packets. • It is responsible for negotiating link establishment. • It negotiates options for Layer 3 protocols running over PPP. • It uses MD5 encryption while negotiating link-establishment parameters. • It terminates the link upon user request or the expiration of an inactivity timer. • It can test the link to determine if link quality is sufficient to bring up the link. • It monitors the link for congestion and dynamically adjusts the acceptable window size. 8. Why are Frame Relay paths referred to as virtual? • Frame Relay PVCs are created and discarded on demand. • The connections between PVC endpoints act like dialup circuits. • There are no dedicated circuits to and from the Frame Relay carrier. • The physical circuits inside the Frame Relay cloud do not contain exclusive links for a specific Frame Relay connection. 9. What best describes the use of a data-link connection identifier (DLCI)? 12. 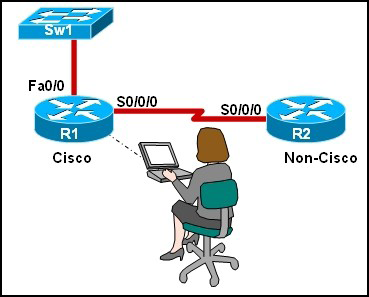 At what physical location does the responsibility for a WAN connection change from the user to the service provider? 13. What does a Frame Relay switch use to inform the sender that there is congestion? Refer to the exhibit. What statement is true about the debug output? • R2 is using PAP instead of CHAP. • The routers have different CHAP passwords configured. • The administrator performed a shutdown on the R2 PPP interface during negotiation. • The Layer 3 protocol negotiation caused the connection failure. • Multiple data streams share one common channel. • Conversations that require extra bandwidth receive any unused time slices. • Time slots are utilized on a first-come, first-served basis. • Time slots go unused if a sender has nothing to transmit. • Priority can be dedicated to one data source. 16. When customers use credit cards to make purchases at a small business, a modem is heard dialing a telephone number to transfer the transaction data to the central office. What type of WAN serial connection is in use? 17. Which best describes data communications equipment (DCE)? 18. Permanent virtual circuits and switched virtual circuits are both part of which option for WAN connectivity? 19. Which field of a frame uses error detection mechanisms to verify that the frame is not damaged intransit? 20. What occurs in the encapsulation process as a data packet moves from a LAN across a WAN? • The Layer 2 encapsulation changes to a format that is appropriate for the WAN technology. • The Layer 3 encapsulation changes to a format that is appropriate for the WAN technology. • Both Layer 2 and Layer 3 encapsulation change to a technology that is appropriate for the WAN. • Both Layer 2 and Layer 3 encapsulation remain constant as the data packet travels throughout the network. Refer to the exhibit. The network administrator is configuring R1 to connect to R2, which is a non-Cisco router. Which encapsulation method will need to be configured for communication to occur? 22. A company is implementing dialup services for remote workers to connect to the local network. The company uses multiple Layer 3 protocols and requires authentication for security. Which protocol should be used for this remote access? 24. What statement best describes cell switching? • It uses a dedicated path between endpoints. • It creates a permanent physical link between two points. • It uses DLCIs to identify virtual circuits. • It creates fixed-length packets that traverse virtual circuits.